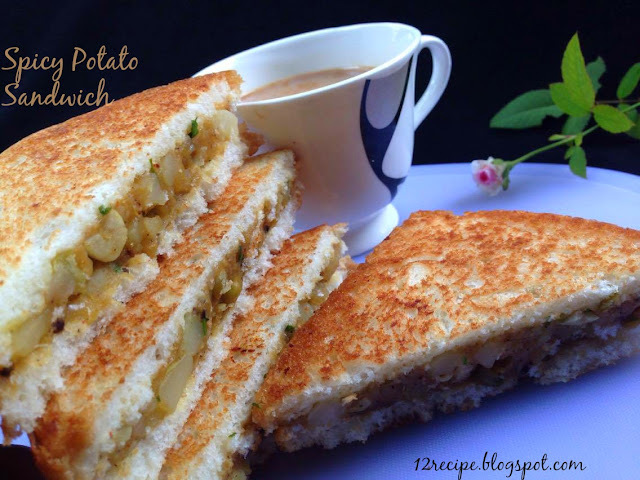 A simple potato sandwich recipe prepared with mashed potatoes and dried green pieces along with some onion masala. 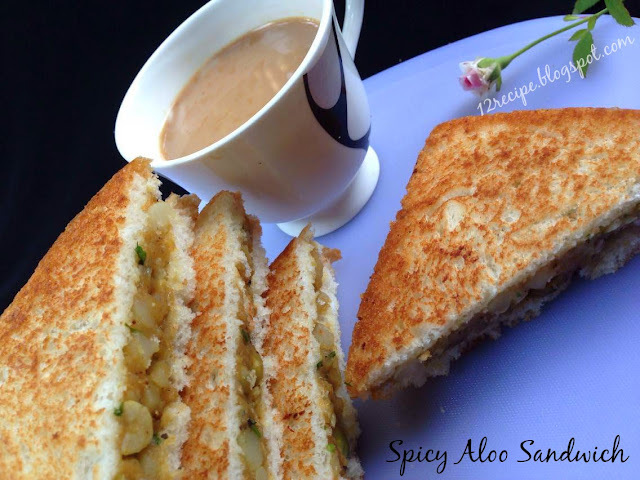 Serve this healthy and delicious toasted sandwich as warm along with a cup of tea. Soak dried green peas in water for 3 hours. Pressure cooks it with washed whole potatoes, salt and enough water for few whistles until cooked. (you can cook both potato and green peas separately also). After releasing the pressure by itself open the lid; drain the green peas and allow the potatoes to cool down. After that peal and mash the potatoes (tiny chunks of potatoes in it along with the potato puree); Keep aside. Heat a pan with oil, splutter cumin seeds. Add thinly chopped garlic and saute for a minute. Add thinly chopped onion and saute until transparent. Add all the powders and mix well. Add mashed potatoes and green peas. Mix well fr a minute. Switch off the flame by sprinkling coriander leaves. Now take a slice of bread and apply the potato masala on top as a thick layer. Cover it with another slice and toast both sides on a heated tawa by applying half a tablespoon of ghee (or butter) on each sides. You must serve warm for the awesome crispy bites of aloo sandwich.